Issue, track, and file 1099 forms for your independent contractors. Sometimes the line between an independent contractor and an employee is fuzzy. However, it’s important to know the difference in order to comply with IRS tax rules. Take an easy quiz to determine whether your worker is an independent contractor or an employee and needs a 1099 or W2. If you pay a contractor for expenses such as equipment rental or supplies, QuickBooks tracks that separately as an expense. Keeping payments to contractors separate from expenses makes it easy to issue and file accurate 1099 forms for the tax year. Seamlessly file 1099 forms online. QuickBooks makes it easy to map contractor payments to the correct boxes on the 1099 tax form. In minutes, you can fill out a 1099 for each contractor that you paid throughout the year. Then, it’s easy to email or print-and-mail a copy to your contractors, as it’s what they use to calculate and file their taxes. In addition to sending the 1099-MISC to your contractor, you also need to file the form with the IRS. With QuickBooks, you can choose to automatically e-file through QuickBooks one-click efile service (electronic filing service) starting at $14.99 for three forms. We are an approved IRS e-file provider, and we will transmit the form securely and electronically for you. Alternatively, you can choose to purchase official 1099 forms within QuickBooks and print them directly from your printer. If you choose to print and file 1099 forms by mail, remember that they are due to the IRS by February 28. More than filing 1099 forms. Run your entire business with QuickBooks. QuickBooks tracks and automatically sorts expenses into expense categories, keeping them organized in one place so you never miss a tax deduction. Easily run expense reports to see how every dollar is spent. 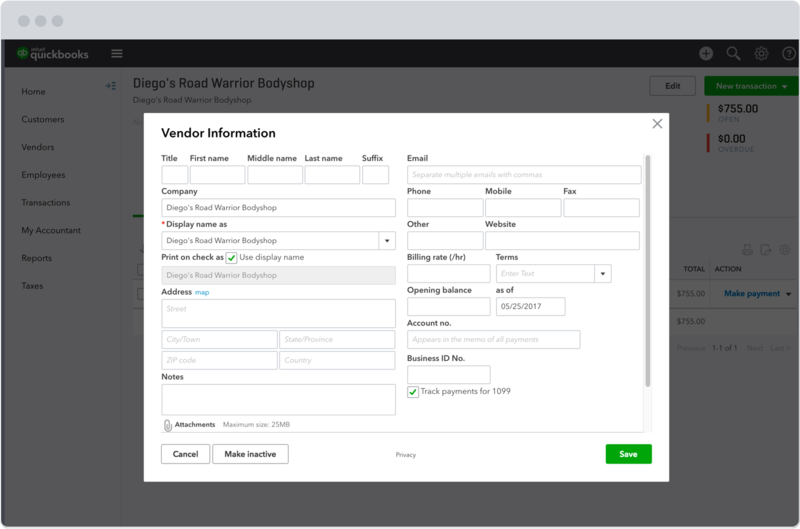 Create invoices customized to your business, complete with built-in payment processing. When an invoice is paid, QuickBooks processes the payment, records the transaction in your books, and transfers the money to your bank account. QuickBooks comes loaded with over 50 pre-built reporting templates. In just a few clicks you can access your balance sheet, cash flow statement, income statement, and over 50 other accounting and business reports. Watch this video to see how to issue and file 1099 forms in QuickBooks. As a small business owner, there are two different tax forms you can issue to workers. If you have employees, then you will provide W-2 forms. If you have independent contractors, you will issue 1099 forms. Read our guide that breaks down the 1099 form box by box, step by step. Many businesses may need to file different types of 1099s depending on the type of work they perform and the ways they use their finances. Read our explanation of the many versions of IRS Form 1099. It’s crucial for small business owners to understand how a W-2 employee differs from a 1099 independent contractor. Explore our guide that explains how to tell whether a worker is an employee or an independent contractor. Form 1096 summarizes the information from the 1099s you’re sending for the tax year. It’s a form that you send only to the IRS and it must accompany the 1099-MISC forms if you file by mail. If you use a 1099 e-file service to file your 1099 forms electronically, you do not need to include form 1096. When are 1099-MISC forms due? 1099-MISC forms need to be mailed to contractors and vendors by January 31 for payments made in the previous tax year. The 1099-MISC forms should be mailed to the IRS by February 28 along with Form 1096. How do I provide my contractors with copies of their 1099s if I use the Intuit 1099 e-file service (electronic filing service)? E-filing your 1099s does not replace the IRS requirement of providing 1099s to your contractors or vendors. If you are using the Intuit 1099 E-File Service, you can download and email (or print and mail on plain paper) your 1099 forms to contractors.